It was a pleasure facilitating both teachers and families in separate sessions at DPS Patna. Each session was of over two hours, though short, were very invigorating and inspiring. It was one of those days where I had to touch down at 8am and take off at 3pm, for I had another session with art world in Delhi, as my baby SPANDAN festival of Performing Arts has been underway at India Habitat Centre, with large format exhibition paying tribute to Iconic Institutions, movements and Gurus. 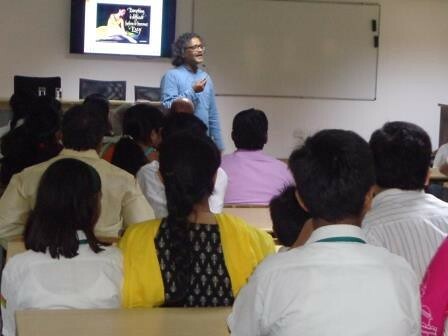 Thanks to Anup and Ragini of Career Launcher Patna, for facilitating and inspiring families in Patna to EXCEL. After receiving a mailer from the alumni office, I registered myself for the interaction with Sushil at India International Centre on July 5th. Having been a proactive participant in interactions with all the directors of IIMB since my days at IIMB, Dr KRS Murthy, Dr MR Rao, Dr. Pankaj Chandra I was eager to head for the session. It gives me immense satisfaction in contributing in some way or other to the Institution apart from being an entrepreneur that this institution has ignited. I am sure hundreds of IIMB alum humbly acknowledge our contribution to their career and life! They have been our alums (Career Launcher) before they became alums of IIMB! Not many may be aware of this fact! I feel delighted to see my paintings and photographs still adorning the walls of the institution even after almost two decades. I vividly recall the interactions that I have had with Dr. Murthy and his encouragement in conceiving the first art exhibition (perhaps only) in the history of the institution. I had managed to inspire quite a few of my class mates and from the next batch to contribute to the exhibition. It was a proud moment to have Mr S M Dutta, then Chairman Hindustan Unilever (chairman BOD of IIMB) to inaugurate that exhibition. Since then, from time to time, my work has featured in the magazines of IIMB. 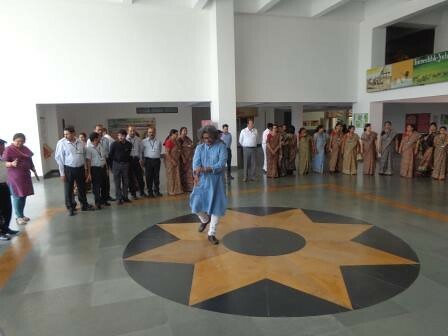 When I arrived at the venue at the appointed hour, there were a few familiar faces from various classes of IIMB. It was a pleasure meeting Dr. Indira Rajaraman, noted economist, who was a distinguished professor economics at IIMB till 1994. I never had the opportunity to be her student, as I entered IIMB immediately after she left, and I have heard about her legendary classes at IIM Bangalore. A little while later I had an opportunity to introduce myself and interact with Sushil informally before the session.. Here is the brief profile of Sushil! Dr. Sushil Vachani, who is a tenured Professor of Strategy and Innovation at Boston University, will took over as Director of the Indian Institute of Management, Bangalore on July 1, 2014. During his twenty-eight year career at Boston University, he served in a range of leadership positions: Faculty Director of the International Management Program in Japan, Chairman of the Strategy and Policy Department, Chairman of the Doctoral Program and Special Assistant to the University’s President for its India Initiative. He designed, taught and coordinated programs for students, executives and policy makers in the US, Japan, China and India. He also serves on the board of trustees of the Deshpande Foundation, which promotes economic and social development in the US and India through entrepreneurship. Dr. Vachani received his doctorate in International Business from the Harvard Business School, a Post Graduate Diploma in Management from the Indian Institute of Management, Ahmedabad, and a Bachelor of Technology from the Indian Institute of Technology, Kanpur. He has extensive managerial and consulting experience in both the US and India. He worked at the Boston Consulting Group developing strategies for US, Japanese and European multinationals. He also worked with Philips, the Tata Administrative Service and Tata Motors in India. Dr. Vachani’s research interests include the global institutional environment of business, multinational-government relations, corporate social responsibility, climate change, strategy and innovation at the bottom of the pyramid and the impact of NGOs on international business. His research has been published in leading journals including California Management Review, Harvard Business Review and Journal of International Business Studies. He has published four books. He is co-editor of Adaptation to Climate Change in Asia and Multinational Corporations and Global Poverty Reduction, editor of Transformations in Global Governance: Implications for Multinationals and other Stakeholders and author of Multinationals in India: Strategic Product Choices. Dr. Vachani loves traveling and spending time with his family. His favorite cities are Kyoto, Istanbul and Barcelona. He also enjoys visiting New York City, where both his daughters live. “With big names you have been associated with, you may at times get carried away. I would not have been to the US had I not been to IIMA, before that IIT Kanpur, before that St. Columbus school….. Thanks to our parents and their wisdom of seeing education to be very important…..
Other day I was with one of my friends and I was carrying this mobile with me..(shows a modest one). My friend showed this mobile to his daughter to tell her that cellphones a couple of years ago looked like these…. ..
Now cell phone reaches 80% of the population…..smart phones will reach 80% in a decade. Everyone will use to access a range of services. What may happen to education? Access will be free. Of course the certification would cost though..
Education rekindles thinking…. With these things at our finger tips we can reach to the world. World is changing. Technology is giving opportunity.. We need to embrace technology else it will be too overwhelming to cope.. The slew of gadgets emerging is going to make life so easy; The human being may be embedded with a few and it is going to impact the way we live .. Massive Open Online Course (MOOCs) – University of phoenix has been a pioneer; later a few moved into online space. For instance, at Harvard, while about 1.6 lakh enrolled for a course on Artificial IntelIigence, only 23000 students completed the course. Coursera and Udacity are a couple of online education and testing platform with huge following. EdX – Harvard and MIT – came together to create the platform… Many units have jumped onto it..
We need to embrace the platform of technology; Which one, let us see.. We will not have spontaneous combustion… F. audience – beaming to whom? Who will be target audience? Can we impact small businesses, real India? Can we all together not impact in these areas. We need to get together.. We have the urge. The institute can be one of the channels… You, as alumni, can engage with us. Institute can help alumni in the international connections too once we get going in the space..
Institute-alum Connect – MIT in the US and IIT Kanpur have a great connect. Sharing Ideas, Regular visits… ..Finally funding by paying up.. Invite editors of journals to address faculty and students.. Need to make our doctoral program strong..
1. Diversity : Mint did an interview of yours where you quoted about diversity. I am a little curious..
we will not dilute quality..
we need to orient and market..
engage alum for exec-edu program? 2. Giving back to society…in what way? Do we look at infant mortality rate, women empowerment… how have we impacted? 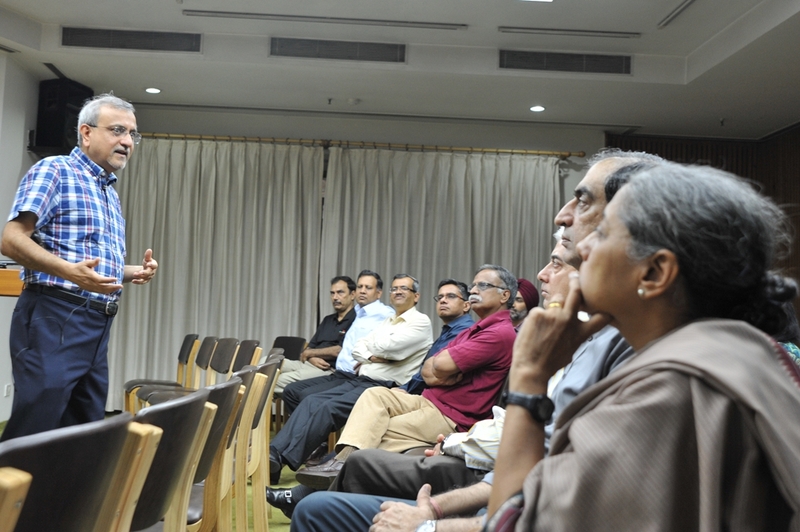 Public sector managers….IIMB lost it after the initial phase when it focused on public sector management. IIT Kanpur is in a bubble.. Outside the gates miserable… The institution has not done anything for the betterment of the city.. Towards the end of the session – Rajeev, an Ex IIMB Prof, now a member of Rajya sabha joined us in the audience and addressed us too..
OurexperimentsatIWSB (Indus World School of Business) have been path breaking..